Today is the first post after succesfuly migrating magdacooks.com for our new 3 year home. If the service is on the same excellent level it’s sure that we’ll stay there with all our projects. I can absolutely recommend Namecheap.com. I never ever had such a pleasure to have a technical problem before. The customer service in Namecheap is on the level that is hard to find anywhere in the world. Recipe is not complicated at all… just if you don’t feel like grinding cream cheese – don’t do it. Make sure though that its as smooth as possible (damn I do it all the time, who would clean grinder 0_o). Start from pouring huge pot of water and boil it. If you feel like it, grind cheese, if not - just use your fork and make it as smooth as possible. Add egg yolks, and sugar, whip smooth. Whip egg whites stiff and gently stir into cheese mix. Add flour and mix good. 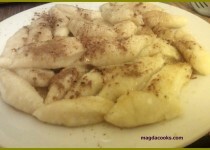 Don’t worry, dough will be very sticky, so sprinkle your ledge generously with flour and make long roll, wide for 2cm. Cut diagonally 1 cm pieces. gently put your kluski into boiling water and cook just 1 minute from the moment they start floating on the surface. Make sure you don't over cook it, it’s terribly mushy and yucky. Drain good and arrange on the plates, pour some yogurt, sprinkle with sugar and cinnamon. All additives are optional. Enjoy the delicate consistency and with a strong cinnamon flavour. P.S. Cookies thoughts: Yes I made the face, when she said it, AND, when she wrote this comment… :) hey I got to stay consistent right? Honestly its quite tasty, but, its just not “my thing”... but once every 6 months, its perfectly fine. 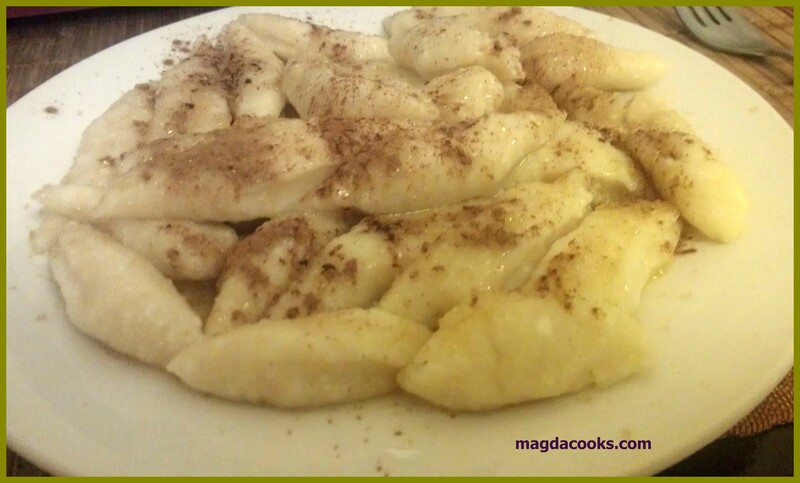 Enjoy this MadgaCooks.com dish, and hopefully you can do it like Magda Cooks… it just right!